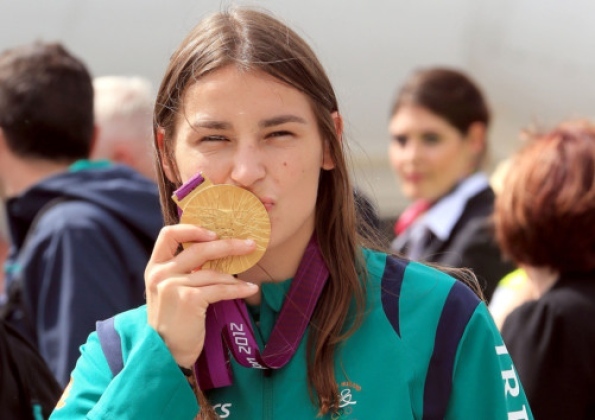 The news that Katie Taylor has been named the “Women’s Boxing Ambassador” by AIBA, (the governing international amateur boxing organization), in the run up to the 2016 Olympic Games in Brazil is a big boost for the sport. Her appointment is important and when Taylor says, “I want to help elevate women’s boxing to ensure it sits at the pinnacle of sporting achievement,” these are not mere words echoed by the Irish Gold Medal Olympian for the press release. Taylor’s amateur boxing career in an out of the ring exemplifies what it means to forge forward using her talent, gumption and immense athletic skills as an entree into a larger world as her following in Europe and Asia shows. Beyond that, in her native Ireland, a scan of local headlines gives a sense of her importance: “Boxing Sensation Katie Taylor to Visit Limerick” read a recent one in the Limerick Leader, while another touted readers to “Win a VIP meet and greet with Olympic Boxing champ Katie Taylor at Whitewater this Sunday,” in the Leinster Leader. And she is so beloved in Ireland that a couple of years ago Taylor was the Grand Marshal of the Dublin St. Patrick’s Day Parade — no mean feat for a girlboxer from Bray representing a sport that was illegal in Ireland twenty years ago. What she is now is not only the pride of Ireland, but the face of women’s boxing to the world; a young woman who through her boxing will help continue to push the barriers that have led to a wide acceptance of women’s boxing in her native country. We can only hope that she is as successful on the international stage. Girlboxing offers our heartfelt congratulations!